The financial crisis that started in August 2007 deeply changed the modus operandi of monetary policy on both sides of the Atlantic Ocean and stimulated a debate about how to formally define and practically implement newly relevant objectives, such as systemic stability, in the reaction function of the Monetary Authorities. 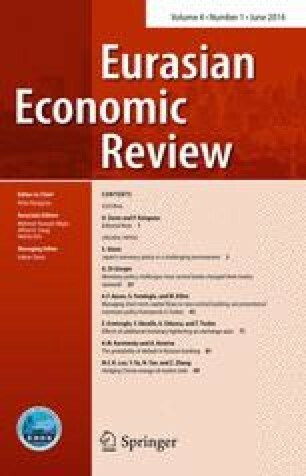 This paper provides an assessment of the monetary policy decisions and interventions undertaken by the FED and the ECB, and evaluates the respective monetary policy regimes in place before and during the crisis according to the lessons derived from the theoretical literature on monetary policy developed in the last 2 decades. This paper has been presented at the 9th Eurasia Business and Economic Society (EBES) Conference—Rome in January 2013. Section 4 draws from a previous joint work with Zeno Rotondi (Di Giorgio and Rotondi 2010). An erratum to this article can be found at http://dx.doi.org/10.1007/s40822-015-0028-3. The author wish to thank Hakan Danis, Stefano Marzioni, Paul Johnson, and an anonymous referee for valuable comments. Any remaining mistake is only to him. Jensen, H., (2002). Monetary policy frameworks and real equilibrium determinacy. Mimeo, University of Copenhagen. [pdf] Available at: http://www.econ.ku.dk/personal/henrikj/pdf/tandirules.pdf [Accessed 2 February 2014].